Eagle eyed customers of mine will notice something new when inspecting my ware. I have a new signature stamp to mark my work. Potters call these maker’s mark stamps or impressions chops. Often they are fashioned of fired clay, carved plaster, or like mine are made of wood. 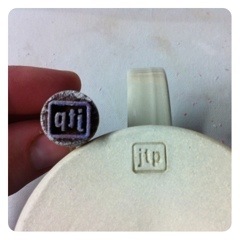 My stamp bears the initials jtp, and will be how my work is marked from now on. I made the decision to change my mark after having a familiar conversation about the serendipity of having the last name “potter”. Shocking, but true, many people incorrectly assume my name really is potter. You’ll be surprised to know my middle name is not “the” too. The mark is pressed into the clay when still moist, but some pots will no doubt escape unstated from time to time. Those that do, will be signed the old fashioned way, with my true last name. This entry was posted in shows, studio on May 3, 2012 by Jennie. Oh, I love how the stamp looks! I hope too many don’t escape without it. It’s a lovely new signature. That is a lovely chop. May I ask where you were able to purchase it? I’m shopping around for one and I’ve had some difficulty finding places to get them made.